Let's Relax Day Spa aims to achieve the harmonious connection of body, mind and soul. 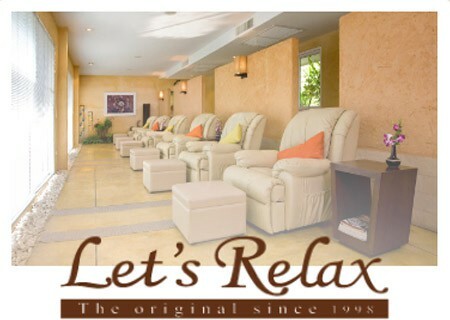 Let’s Relax Day Spa provides highly trained therapists with experiences with modern trainings and professional licenses, who can provide various massaging styles in a professional manner. Massages are conducted on modern adjustable spa bed, comfortable mattress, relaxing soft leather chairs or imported Back and Shoulder chairs. Sterilized towels, blankets, bed sheets and pillowcases are being used for each individual treatment. Loose pajamas and disposable underwear are also provided for guest’s comfort (for selected treatments). Imported spa products such as Mineral Mud from Israel’s Dead Sea, Sea Salt Scrub are being used to ensure high quality. Let's Relax Day Spa's treatment combines different healing practices from the traditional Thai Massage to Swedish massage to modern healing techniques with the use of western spa technologies, providing different types of treatments.